With Summer on it’s way I thought I’d finish off my last bottle of my favourite Summer Red 2006 in time to stock up with some bottles of 2007. A delicate, light-bodied red wine that should be served lightly chilled. The wine is a vibrant cherry red colour with lifted aromas of raspberries, ripe cherries and a hint of spice. These fresh berry aromas are reaffirmed on the palate. With fine, well integrated tannins, a juicy clean mouth feel and a fresh dry finish, this is the perfect wine to sip on. I really don’t think you can go wrong serving this lightly chilled at at BBQ. With some modern rosé wines being more like “watered down reds” this wine is THE choice to spring on people as a fantastic alternative. 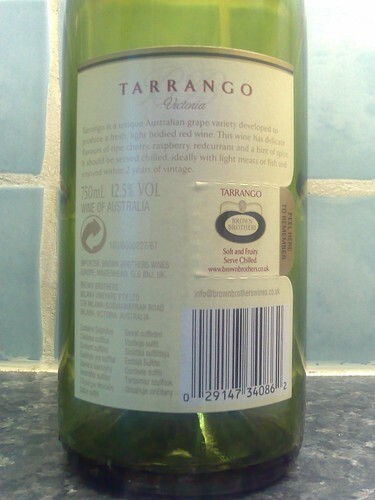 Tarrango is a unique Australian grape variety, bred by CSIRO scientists in 1965 by crossing the Portuguese red grape variety Touriga with the versatile white grape Sultana. It was developed specifically to produce a light, fresh red wine ideal for summer drinking in the many countries with warm to hot summers. Named after the tiny township of Tarrango in the Mallee district of north-west Victoria, where it was designed to thrive, the vines bear generous crops that ripen late and maintain a fresh acidity and soft grapey flavour. The Brown family has been making wines from Tarrango since 1980. In recent years, a small amount of fruit has been fermented by the carbonic maceration technique, as practiced in Beaujolais and other areas in southern France, where berries are allowed to ferment whole and uncrushed. This contributes added complexity and flavour to the final wine. 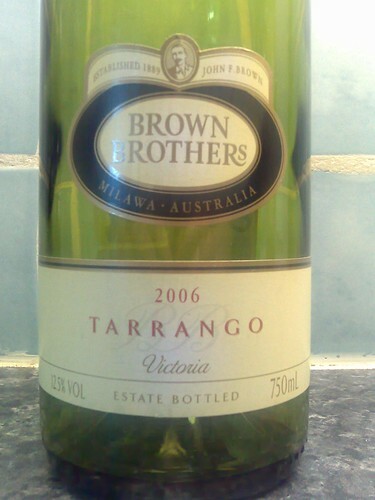 The Tarrango grapes used to make this wine were grown in Victoria. The fruit was harvested in parcels from late February until the end of March at a range of baumé levels from 11.5° to 13.0°. Approximately eleven percent of the fruit underwent carbonic maceration. It was then blended with other parcels and bottled soon after fermentation and was completed with an alcohol of 12.5%, a pH of 3.45 and an acid level of 5.8g/L. I’ve consumed a fair amount of this wine in the past so my wine tasting notes aren’t too detailed (are they ever?). Hmmm… Just as nice as ever, a touch more dryness than I remember, maybe due to age? Still almost refreshingly fruity but that nice dryness to make you want more. Well, there you have it. A real winner. I’ll give it 4 stars as it doesn’t quite make it into my “all time greats list” but is still a great Summer wine. Enjoy! Just before Christmas I bought a few “cheap” half cases from Tesco to bulk up my wine supply. One was a Peter Lehmann Barossa selection. I quite like their “Clancy” blend so I was interested to try this out. The Peter Lehmann website is excellent with lots of information about his wines plus an explanation about his “Queen of Clubs” labels. According to renowned Barossan artist, Rod Schubert, the Queen of Clubs is “the gambler’s card”. Indeed it was a great gamble that Peter Lehmann took when founding the company during the turbulent, uncertain times of the late 1970s and early 1980s as the Australian wine industry was faced with international competition and a grape surplus. Peter Lehmann is a great fan of American author, Damon Runyon, who created memorable characters modelled on the colourful characters on New York’s fringes. At this tumultuous time and inspired by one of Runyon’s more engaging characters, the gambler, Sky Masterson, Peter Lehmann said “If anything’s a gamble, this is, so we’ll call the company ‘Masterson’ – ‘Masterson Barossa Vignerons’”. 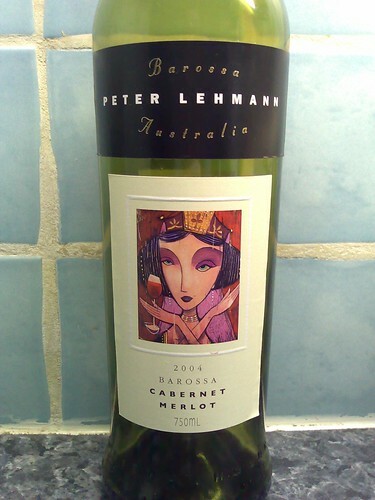 Although trading as Masterson Barossa Vignerons until 1982, Peter Lehmann’s name was always on the label, with the Queen of Clubs proudly featuring as the logo. In 1982 the company name was changed to Peter Lehmann Wines. In 1996 the Queen of Clubs took on a new, exciting personality for each of the wines, reflecting their individual style and character. I quite like the style myself, mixed with interesting bottle shapes. Is the wine any good though? Cabernet Sauvignon and Merlot, two of the world’s great red wine varieties, flourish in the Barossa. As single varietals they have made their mark, but blended in carefully selected proportions, each brings to the other an added dimension to give a red wine of classical breeding and distinction. 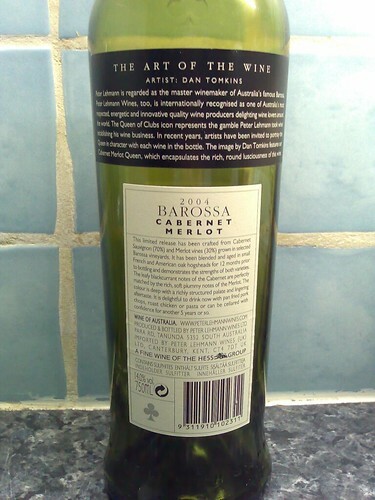 2004 was an exceptional red wine vintage in the Barossa, giving wines with superb fruit definition, structure and finesse. 70% Cabernet Sauvignon and 30% Merlot, this wine is deep black garnet in colour with a bouquet of soft chocolate, dark plum and violets. Hmmm, okay I suppose, the cab sav overpowers the merlot a little too much. Strong and a bit overpowering, wrong food? Even given the wrong food choice I still reckon this wine lacked a little… class? It seems a bit too much “in you face” without having the subtle plummy undertones you’d expect with a wine containing Merlot. I’d have it again but this will have to be ranked as a 3 star, average wine. When I think of Rioja, I always picture this bottle in my mind. The classic wired body and clouded glass. I have fond memories of this wine, I seem to remember that the 1981 was excellent. So, did the memories flood back…? 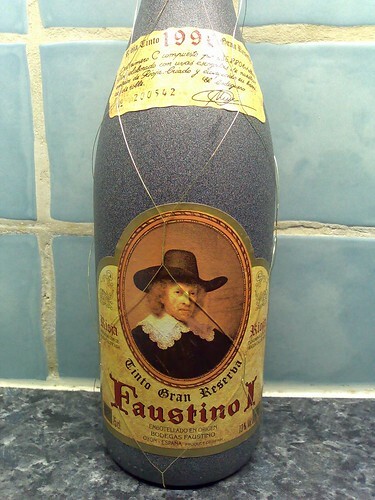 The wine is made by Bodegas Faustino in Northern Spain. The vineyard has been arount since 1861 when Eleuterio Martinez Arzok moved to Oyon and bough a palace and vineyards from the Marques del Puerto. Faustino I was first launched on 1960 along with Faustino V, VII and Don Faustino. Urgh, bad bottle? No, but not great. Tannins, but also maybe sour? Not smooth at all. I disliked it so much I drank very little. What did it taste like the next day? Oh dear, that was not good. The wine had no smoothness at all and had a distinctly sour aftertaste. I hosestly thought it could have been a bad bottle but it wasn’t quite bad enough. I’ve given bad wine a second chance before but at over £10 a bottle someone would have to send me a bottle for free!! With decent reds from the New World available at <£10 it’s only a matter of time before disappointing Old World reds like this one die out. One Star. I chose this wine to be one of my Christmas Day 2007 wines. 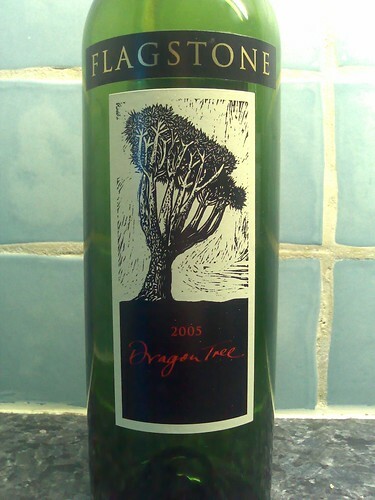 I liked the look of it, the blend sounded interesting and it was quite expensive at £10 for Supermarket “plonk”. Flagstone (terrible website design!) are a South African vineyard who have just been bought by wine monolith Constellation Brands (who own Kumala, the biggest selling South African brand in the UK). They must be doing something right then. The wine takes its name from a Dragon Tree given to the Port Captain of Cape Town, by a passing ship’s captain over 100 years ago which grows above our barrel maturation cellar. Originally from the Canary Islands this tree has blood red sap. Legend tells of a wicked Dragon who sat at the Pillars of Hercules and blasted ships with lashings of fire as they sailed past. Eventually she was mortally wounded and flew forlornly off to sea to die. Only where her blood landed on earth (on a few remote islands and around the edge of the Mediterranean) do Dragon Trees grow. 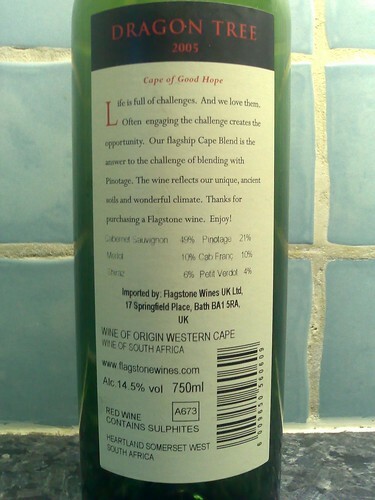 The wine is a blend of Cabernet Sauvignon 49%, Pinotage 21%, Merlot 10%, Cabernet Franc 10%, Shiraz 6% and Petit Verdot 4%. For those of you who have never heard of the Cabernet Franc variety before, it’s what was crossed with Sauvignon Blanc to create one of the world’s most famous varieties, Cabernet Sauvignon. Now, that’s a wine fact! Yum! What a great wine! Rich tannins mixed with smooth Merlot-like plummyness (is that a word)?? Nice. Yes, this was a lovely wine, it went really well with our Christmas goose. I’ve had a second bottle since (as the wine consumption on Christmas day was quite high) and enjoyed it again. I’m not sure how to rate this though. It’s a lovely wine bordering on 5 stars but the price is quite high so I think it’ll have to be rated 4 stars (but with a note saying if you can pick up a bottle for ~£7.50 or less then this is a MUST BUY). I love sitting at the table on Christmas day, eating well and sipping some lovely wine with my family. A nice wine, I think, is a must. Here are my top wine picks for the festive season. If you’re looking to splash out then you can’t go too wrong with my favourite red, Château Musar. If you can get a bottle from ~1996 to 1999 then it should have aged well and be a lovely smooth robust wine. Should cost ~£14 a bottle but may be more for the older vintages. If you’re looking to spend a little less then you should try Ravenswood Lodi. This wine was highlighted in the excellent Oz and James’ Big Wine Adventure on BBC2. James May has been looking for a good quality affordable wine, in the Ravenswood Lodi he found it. At ~£7-8 a bottle this is excellent value and strong to boot! This wine was also highlighted in The Daily Telegraph recently so it’s a wine to look out for. My bargain of the year must be McGuigan Gold Shiraz. I’ve recently posted a lot about this being available at crazy prices, go get some! A wine somewhere between a classic Shiraz and a Merlot, easy drinking both with and without food. Again, I have to recommend my favourite white, Highfield Sauvignon Blanc. For ~£11 a bottle this is an excellent bargain and something different to the usual premium Sauvignon Blanc of choice, Cloudy Bay. 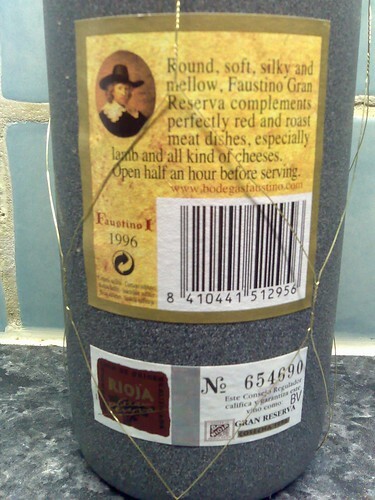 Drink this with your Christmas ham/gammon, fish or even with your canapés. For something different try a Gewurztraminer (again great with ham). I liked the Sainsbury’s Taste the Difference Gewurztraminer. A nice example, off-dry and floral in aroma. It’s strong flavour makes it a good choice for stronger food, for those moments over Christmas when you can’t be bothered to cook so you get a take-away! Should be ~£7 a bottle. At the cheaper end of the market are two excellent wines. Brown Brothers Dry Muscat (<£5) is a delicious dry floral wine which is great on it’s own or as a Kir. Hardy’s Stamp Riesling Gewurztraminer (<£5) is sweeter than normal but an excellent glugging wine. Hopefully you followed our Great Summer of Rosé. The winner, Pink Elephant, is an excellent example of a rosé and great again with your Christmas take-away. Available from most supermarkets at ~£4 a bottle. For your special fizz why not try something different this year and go for a premium Sparkling Wine from the New World. I’ve got in some Cloudy Bay Pelorus (both Vintage and Non Vintage). These cost about the same as a decent Champagne at ~£16 per bottle. If you’re looking for bargain fizz try a Processo (Italian “Champange” from the Venice region). Usually available for <£6 a bottle Prosecco tends to be less dry than most Champagnes and the bubbles, in my opinion, less gassy. This makes it an excellent party wine without the gassy side effects! I like La Gioiosa Prosecco from Tesco but all the major supermarkets will do a similar wine. Instead of a Port this year I’ve stuck with De Bortoli and bought their 21 year old “Old Boys” port (PDF fact sheet). I know they’re not allowed to call it Port but I will (with a lower case “p” though). This is really intense, just how I like my port. I hope you’ve enjoyed our guide to wines for this Christmas. If you do try any of these let us know via a comment what you thought, we’d love to hear from you. Most importantly though, whether it be a £4 or a £40 bottle, enjoy it and have an excellent Festive Holiday! Click these to help us out! Make sure you switch off any Ad blocker to see ITs Food offers!